Yippeeee! It's my birthday!! I love my birthday! Right in the middle of Present Month!! I baked the cake and Gus decorated it, and [various family members take note] it is vanilla (actually it's Funfetti, which is vanilla with multi-colored sprinkles - yeah, baby!!) cake with chocolate icing, the Proper Birthday Cake Combination. Have a great my birthday, everyone, and stay tuned tomorrow for The Most Excruciatingly Adorable Thing That Will Make You Screech With Happiness. Happy Birthday! That is a beautiful (and not beau-tee-ful!) cake. When I reopen my cake business, Gus is hired! I love you, dear sister. I hope your day is special! It sure seems like just yesterday, that December 12 of a few years back! I hope your 39th birthday is just superb. Much love. Happy birthday, friend! From one December baby to another, I love December too! I'm so glad you convinced me to spend so much time on Ravelry. I might have missed the special day, otherwise!! Happy Birthday, a less than two weeks late! 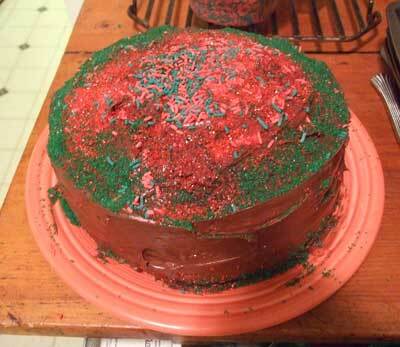 I hope the red icing eventually came out of all of the whites. Zee bear he continues to be adorAble.